One glance at all the glitzy tech out there, and you would think that it would be safe to say that the last thing on anyone's mind right now is another Back to the Land movement. Yet BBC World's show The Bottom Line just interviewed American investment pundit Jim Rogers, who predicts that is precisely what the future holds. As the above infographic from agricultural biochemical company Agricen testifies, in the next 40 years, we will have to produce as much food as in the previous 10,000 years combined. I don't know where they got their statistic, but it is an alarming one. This trend, though, points to the key for critical cultural transformation of developed economies in the coming decades. Rogers has seen young workers flooding into MBAs, marketing, PR, communications and tech over the past 30 years. But he argues: "You can't eat press releases." 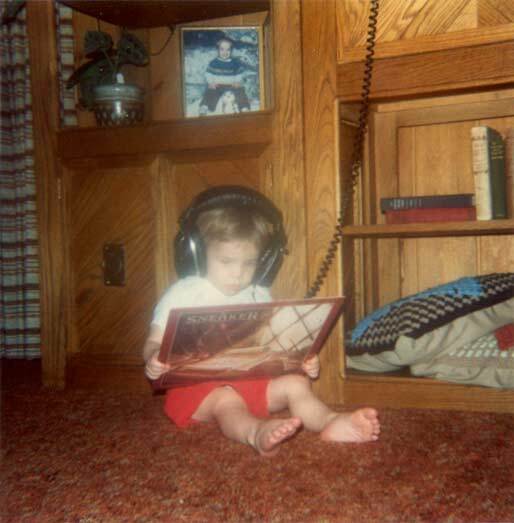 Rogers has been a fan of farmers and agricultural commodities for many years. "I am extremely optimistic about agriculture. First people thought I was nuts when I first started telling people to buy farmland, then they thought I was nuts, now they are trying to buy it too." He believes that even though commodity prices have reached historic levels the past few years, they will continue going up, at least for a while. "Even though demand has been going up for a long time, we are still consuming as much as we are producing," he says. 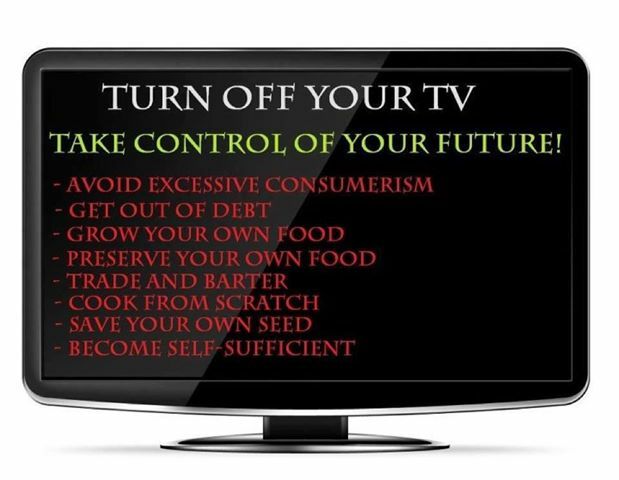 "The 3 billion people in Asia have seen TV how we live in the U.S. and want to live that way now. Before this is over, prices of all agricultural products around the world will go higher." Rogers, who was raised in Alabama, now lives in Singapore. He predicts Asian countries, such as China, will be the global economic leaders in the future. He also believes they will hold the best investment options. "I don’t want to have many assets in the U.S. I am a U.S. citizen, but I think in the future there may be laws that keep you from taking money in or out of the U.S."
Rogers says, if you are going to keep assets in the U.S., farmland is the best option. "Farmland is a great way to preserve your wealth and increase your wealth, if you can stay with it." Even with farmland sales topping $20,000 per acre, he doesn’t believe the market is in a bubble. But, you won't see him at Midwestern land auctions dropping that kind of cash. Instead, he says there are greater profits to be made buying land in other parts of the world, such as Paraguay, Africa and other developing nations. "Percentage gains will be higher in other countries than the U.S., he says. Rogers says if the U.S. continues to have large debt issues, which is likely, agriculture will become more and important. "When a currency declines, the people who have real assets are the ones that make money. If the dollar collapses, one of the few ways you’ll be able to reserve you wealth, and even make money, is through productive farmland." Rogers says the only reason he is nervous about agriculture’s outlook is that America’s farmers are growing older. Currently, the average age of U.S. farmers is 57, a number that has been steadily rising for two decades. Even with technological advancements, Rogers is worried about the future. "Somebody has to be in the fields, even if it is a robot driving your tractor," he says. 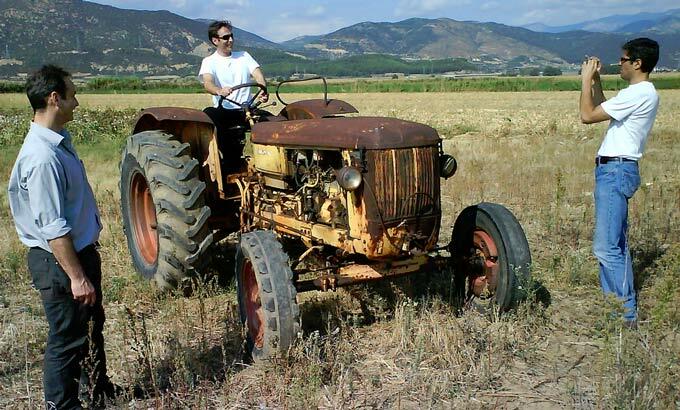 "Someone has to tell the tractor what to do. Unless we do something about getting manpower into agriculture, eventually we run out of food." He encourages young people to consider a career in farming, if for no other reason, the money-making potential. "The stock brokers are going to be the ones driving taxis in the future, and the farmers are going to be the ones driving Lamborghinis." Is it time to remember the 1960s and 1970s, to crack out copies of Organic Gardening and Mother Earth News? Will Harrowsmith magazine - which folded in 2011 - be revived? 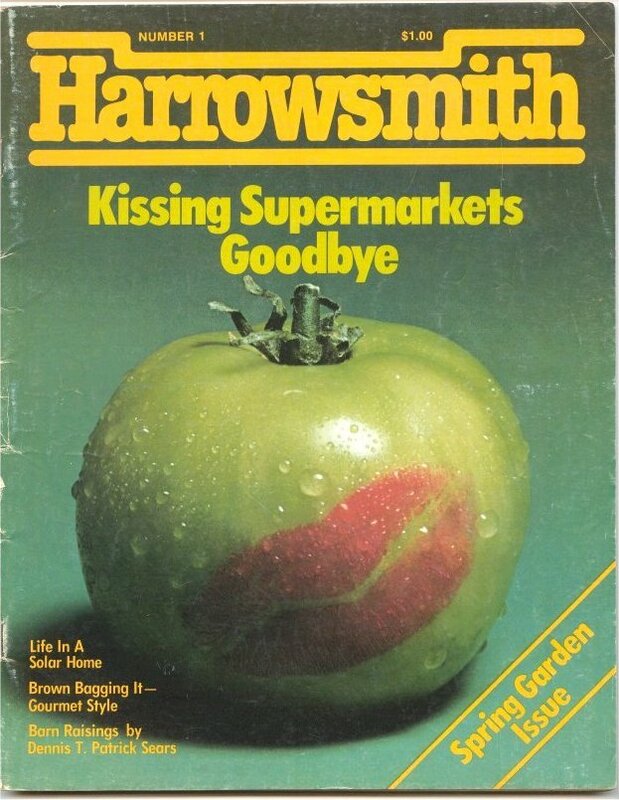 Harrowsmith, devoted to Canada's back to the land movement, once was Canada's leading magazine read outside the country. It was published between 1976 and 2011. Image Source: Vaxxine. Farming is big industry now - there are even tractors which drive themselves, sort of like Roomba vacuums, except much larger and remote-controlled via the farmer's computer. Contrast the anachronistic paradox of back-to-the-landers who use horses for cultivation 'because it's better than the environment.' These newcomers are naïve (farmers certainly see them as such), but these neo-traditionalists have a point about modern farming techniques becoming so industrialized that they are alien to the homely, hard work of earlier days. And it is homeliness, the search for the return to what really matters, which sees the value of farmland and agriculture rise, emotionally and economically in times of economic distress. Land is irreducible. And it isn't all for dreamers, since as Rogers indicated, demand for food will rise globally in the coming decades. Farming will be a viable economic undertaking and agricultural land will become increasingly valuable. To return to the land is essentially a conservative movement, but a Millennial back to the land movement potentially will bring progressive maker movement solutions to farming: less Big Industry, genetic modification and heavy pesticides - more organic farming and cooperatives, supported by newly invented, high tech solutions. This will happen, that is, once farming's new arrivals get tired of ploughing their farms with horses. Because of the Great Recession and growing demand for agricultural products, plus the inherent emptiness of the imploding materialist consumer culture, the great urbanization trend of the 19th century has begun to reverse itself, 21st century predictions of Super Megacities notwithstanding. As young Greeks return to agriculture, they realize farming is not that easy. Image Source: Olive Oil Times. Nikos Gavalas and Alexandra Tricha tended to their snail farm in Chios, Greece. Image Source: NYT. Over the past year, young Greeks, facing unemployment rates of well over 50 per cent (currently, it's 57 per cent), have returned to the land and agriculture in order to survive the recession. Some of them are creating communes, organized through the Internet and social media. The Orthodox Church owns about 40 per cent of agricultural land in the country and is allowing anyone who wants to farm Church lots to do so. 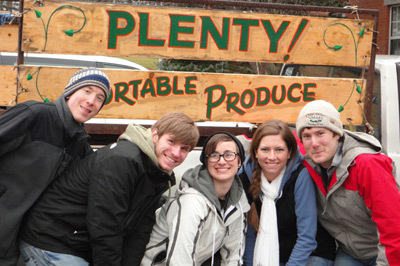 Gen Y students at the University of Wisconsin Green Bay spent their spring break of 2011 not at Daytona Beach, but learning sustainable agriculture in Virginia. Image Source: University of Wisconsin Green Bay. Millennials in America are looking back to the 1990s, when Gen X graduated into a recession. That era saw Gen X move into high tech as the economy recovered. But there were books published at that time, such as, New Pioneers: The Back-to-the-Land Movement and the Search for a Sustainable Future by Jeffery Carl Jacob (1998) which hinted at alternatives. Perhaps it is starting to become evident to Generations X and Y alike that recovery, when it comes, will not be the long golden age of post-war prosperity that the Boomers enjoyed in their youths. Rather, it will be a brief respite before another recession. More crashes are constantly predicted over the coming decades (see here, here, here, here, here, here, here and here (thanks to -H.)). When that realization dawns, who wants a PR job? You want fundamentals. The world will never be the same. But you can go home again. Image Source: Survivalist and homesteaders' page on Facebook. In Canada and the US, urban farming is very popular, as are Millennial homesteading, hobby farming and backyard farming. A lot of people blog about their experiences with a so-called post-consumer lifestyle. There are shops with supplies and Websites with advice on how to stay off the grid. The Mother Earth News runs an annual list of Star Modern Homesteaders. You can see the 2013 nominees here. The Fraser Valley, British Columbia, Canada. Image Source: Wiki. In the Fraser Valley, land that would have sold for $25,000 per acre five years ago is now going for $50,000 to $80,000 an acre, even up to $100,000 an acre or more with high-return blueberry crops already planted. Farmland price changes from 2011 to 2012, USA. Image Source: Farm and Dairy. "Lambing time. 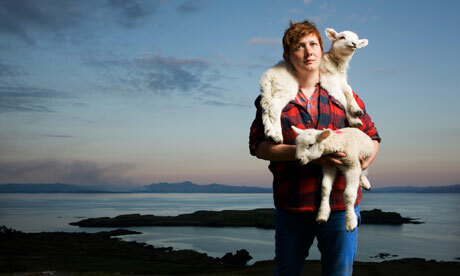 Sarah Boden, a former journalist with the Observer, returned to her native Eigg [in Scotland] to farm sheep and cattle." Image Source: Murdo MacLeod for the Observer. 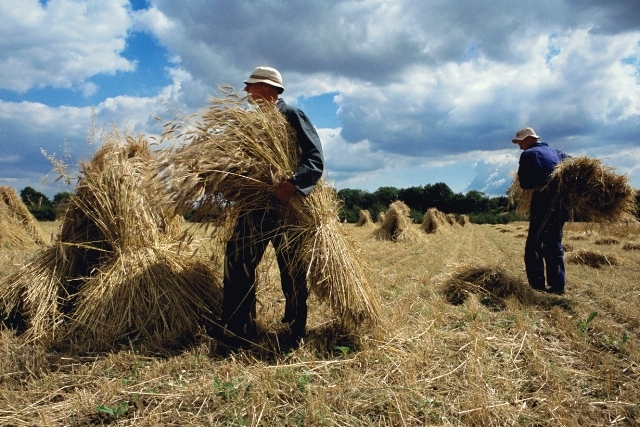 The Land asks: Can Britain Farm Itself? Image Source: Fife Diet. In Britain, people are dumping increasingly insecure white collar jobs to return to agriculture. There is a Campaign for Real Farming that announces its aims in eight steps. The Campaign begins by calling an entire generation back to the land. Agriculture is in total disarray, and everything needs rebuilding and streamlining. The Telegraph, unsurprisingly, jumped on the bandwagon already back in 2010, and insisted, It's Time to Get Back to the Land. The Land, a magazine about land rights, asked Can Britain Feed Itself? in 2007. At that time, its proposal excited little interest. Now, post-recession, it has revived its plan for British farming self-sufficiency or near-self-sufficiency and the interest is there. 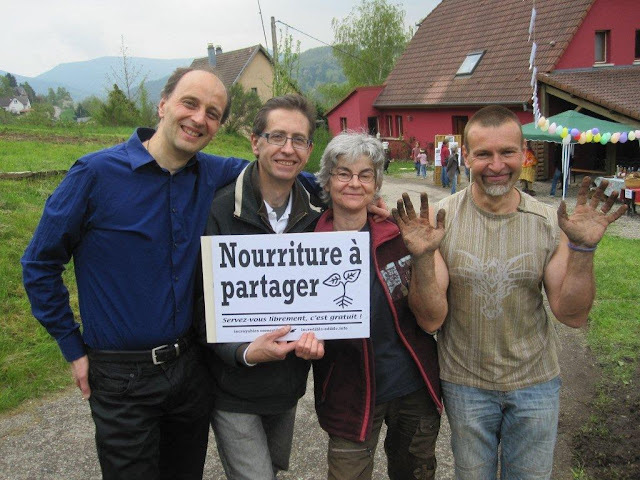 Leaders of Incroyables Comestibles in Fréland in Haut-Rhin, in the Alsace region of France. Image Source: Incredible Edibles. Called Incroyables Comestibles, the French version of the Incredible Edible movement, which began in the UK in 2008, involves planting collective vegetable gardens in easily accessible public spaces, such as school yards and in front of police stations, from which each can pick for free, according to his or her own need. In France, this movement began in the spring of 2012, and has spread to the four corners of the Republic, thanks in part to social media. In the Loire valley, Pierre-Yves Fromonot and his wife and his wife offer internships on how to return to organic farming. You can see a report on their business here. There is also renewed interest in, and respect for, some old French agricultural techniques, as evident in this 2012 story about a Californian chicken farmer who traveled to northern France to learn how to better care for his poultry and to bring back healthier, non-genetically modified breeds. See an interview Jim Rogers gave to Forbes in 2012 below the jump on this topic. Image Source: RT via EX-SKF. The search for energy to fuel the Technological Revolution and drag us out of the economic doldrums continues. The blog, EX-SKF, which covers the ongoing crisis at Fukushima, has another interesting story today. The Russians have designed floating nuclear power plants for use in the Arctic Sea to supply isolated settlements with electricity and to desalinize sea water. Two energy nightmares - carbon and nuclear - look set to converge. Perhaps these plants will also support oil exploration around the Pole? Why do I get the feeling that the Arctic will be the next Middle East? Canada's current PM, Stephen Harper, was elected after sounding hawkish about the Arctic and planning increased military presence in Canada's northern territories. 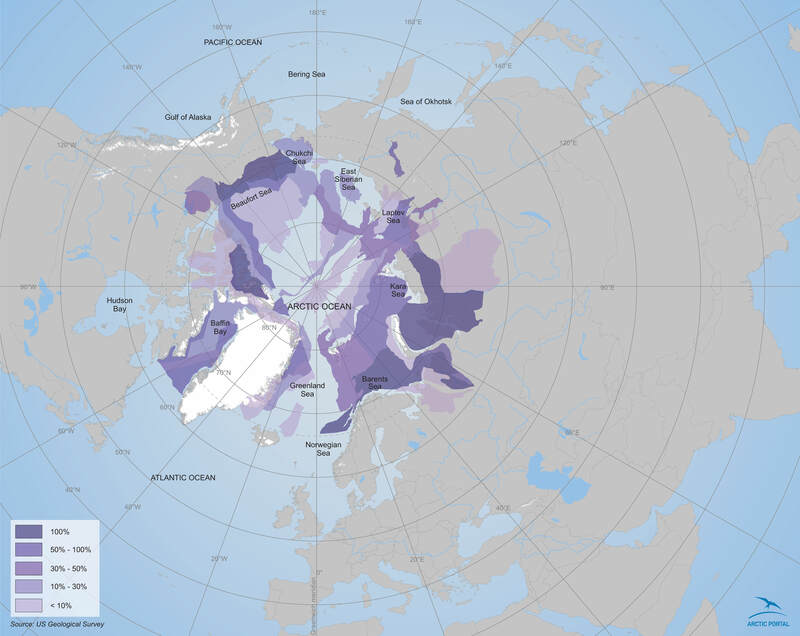 His Arctic policy stalled during the recession; although in 2011, Russia and Canada rattled sabres over the Arctic Ocean and the oil and gas beneath it. Potential oil and gas fields in the Arctic (see enlarged map here). Image Source: Arctic Portal. 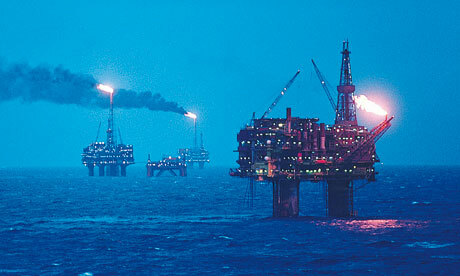 The high price of oil and associated profits of off-shore drilling are fueling plans for Scottish independence. Image Source: Guardian. 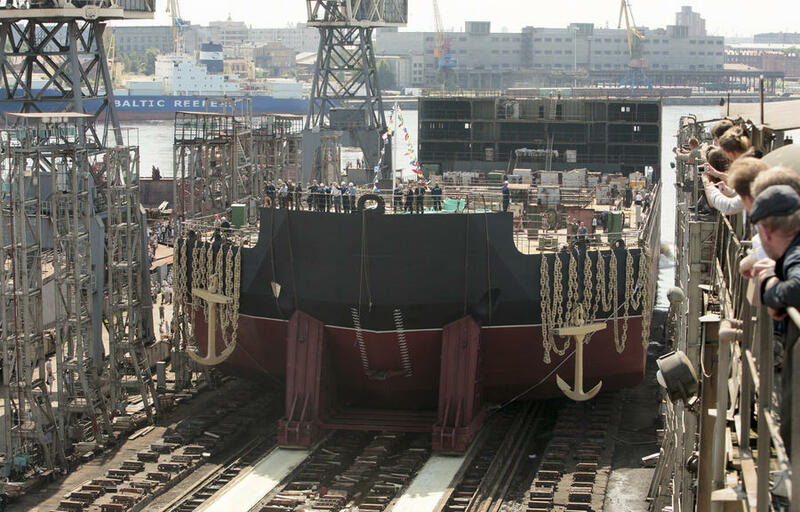 According to Oilprice.com article quoting from an RT article in Russian, the floating nuclear plants are based on the Soviet-era nuclear-powered icebreakers. Note that the source for the information on floating nuclear plants is Russia Today, a media mouthpiece of the Russian government. See my other posts related to Russia, here. 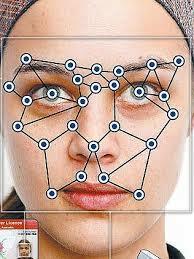 Facial recognition systems are appearing in gadgets such as iPads and iPhones, as well as advertising media. Image Source: Approach Mobile. Our OptimEyes face detection technology is bringing digital, placed based media into a new age of customer insight, measurability, campaign management and optimisation. This revolutionary technology, delivered by leading Face Detection business Quividi, allows advertisers, to accurately measure in real time the type and volume of people that see their ad in any given location and at any time of the day. Amscreen has a portfolio of 6000 screens across forecourts, healthcare venues, convenience stores and travel hubs and the roll out of this technology will represents the largest of its kind anywhere the world. The integration of this technology and the customer insight it provides will be integrated and further enhanced with shopper mission, buying behaviour and EPOS insight to provide an even greater understanding into the effectiveness of any given advert across our entire network. For a live demonstration of Amscreen’s Face detection and a discussion about how this can deliver these benefits for you as an advertiser or estate owner, please get in touch. "It is time for a step-change in advertising – brands deserve to know not just an estimation of how many eyeballs are viewing their adverts, but who they are too. Through the creation of our new platform, OptimEyes, advertisers will have instant access to all of this information, meaning we can deliver the type of insight that only online has previously been able to achieve." 2SEAS UAV Project, University of Southampton. Image Source: Popsci. At first glance, it looks like someone forgot to put the cockpit on a plane. Twin engines give the 2Seas Project unmanned aerial vehicle speed and power, but between them, where a normal airplane would put a pilot, there is instead just a camera, attached beneath the wing and always facing forward. This drone, made mostly of 3-D printed parts, could as soon as 2015 use that camera to hunt drug traffickers in Europe's North Sea. 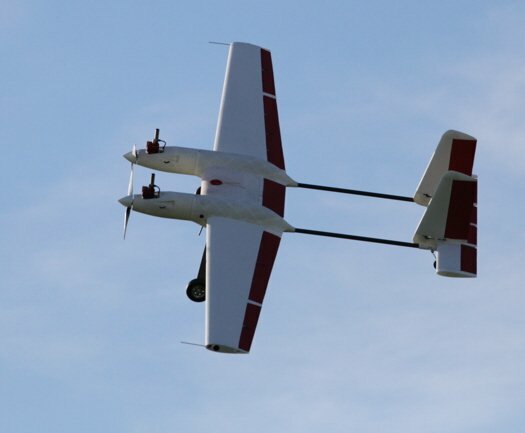 2SEAS is the younger cousin of SULSA, the first 3-D printed drone, which premiered in 2011. Both drones were made in the United Kingdom by University of Southampton researchers. With a lattice-like, geodesic-reinforced frames, the aircraft are both strong and light. There are two main differences between the 3-D printed aircraft. The SULSA is entirely 3-D printed, with the exception of its electric engine. This is possible at its small size. 2SEAS, by contrast, has a wingspan more than twice that of the SULSA, which meant the wings and tail were too big to be printed. Instead, they were constructed out of carbon fiber. 2SEAS's main body, the part that houses fuel, surveillance equipment, and engine mountings, is 3-D printed. The other major difference is power—the SULSA uses a single electric engine to power its one propeller, while the 2SEAS has a gasoline engine. SULSA can fly for 40 minutes on electric power. 2SEAS, with its larger wingspan, twin propellers, and gasoline engine, has a flight time of six hours, cruises at 55 mph (just fast enough to follow a smuggler's speed boat), and can carry more sensors than the SULSA. Masao Yoshida, Fukushima 1 plant director at the time of the March 2011 accident, has died. Image Source: EX-SKF. "Masao Yoshida (age 58), who was the plant manager at Fukushima I Nuclear Power Plant, died in the morning of July 9. Sources at TEPCO revealed the news to Mainichi. While he was the plant manager in March 2011, the Great East Japan Earthquake and the nuclear accident happened. He led the accident response at the plant. He left the post in December 2011. He underwent an emergency surgery in July 2012 for cerebral hemorrhage." [In his own words:] "I don't know if I was prepared, but in the end, if we were to leave and water injection stopped, more radiation would leak. Then, Reactors 5 and 6, which were somehow stable, would melt, I mean the fuel would melt, once there was no one at the plant. If the plant was left all by itself, more radiation would leak. We managed to stabilize Fukushima II (Daini) Power plant, but we might not be able to be there [if Fukushima I was abandoned and more radiation leaked]. That would be a catastrophe. If you think that way, there is no way we could just run away. In a Buddhism text that I've been reading for a long time, there is a mention of divine figures issuing from the ground. That was what I felt was happening in the hellish situation at the plant. Workers would go to the scenes of the accident, then come back upstairs (at the Anti-Seismic Building), they were dead tired, without sleep, with not enough food, reaching the limit of their physical strength. Then they would go out again, and come back, and go out again. There were many workers like them. When I saw these workers, I knew I had to do whatever I could for them. It's my belief that we have been able to restore the plant to the current level [of relative stability], because of these workers." See my earlier posts on the sacrifices made by the Fukushima Fifty workers during 2011, here and here. Their courage prevented a global environmental catastrophe worse than what occurred. Clubbers who have made "Get Lucky" this summer's dance-floor anthem will be shocked to hear that Daft Punk aren't the robot-friendly sound of the future – but revivalists of Seventies progressive rock, once the most derided of genres. Prog, a bombastic mutation of rock and classical genres typically performed by highly skilled musicians in outrageous capes, could once be heard echoing from student halls and stadiums across the land. Supergroup Emerson, Lake and Palmer sold 40 million copies of their symphonic rock while Genesis, Pink Floyd, Yes and Rush became prog's most commercially savvy flag-bearers. In the end it was punk that swept away those highly designed concept albums with their epic or medieval themes and ostentatious, lengthy, and, some would say, self-indulgent displays of musical proficiency. Long dismissed as laughably self-important and pretentious by critics, progressive rock combined classic rock and hard rock with more complex classical and jazz musical styles. It also amalgamated some of the wild lyrical images from Psychedelic rock and the Canterbury scene. Wiki notes that it was "an attempt to give greater artistic weight and credibility to rock music." Progressive rock was rooted in no-nonsense electric guitars, but it embroidered upon classic riffs with gorgeous, elaborate layers and florid lyrics with loaded metaphors. Using a bigger and bigger sound, it overlapped with the big sound and themes of stadium rock favoured by groups such as Queen, Journey, Foreigner and Styx. This style also influenced power ballads produced by hard rock groups. Progressive rock was a style conceived as high thinking for the masses, for the isolated or downtrodden, for the little man. It took everyday, depressing, banal situations and blew them up to epic levels, to the realms of myth, karma, mystery and eternity. Moments of individual alienation (being unpopular in high school, romantic break-ups, losing a job) were gnostic triggers, doorways to more profound and exalted levels of thinking. This probably made prog the most conceptually complex form of rock music. This is Spinal Tap Stonehenge sequence. Image Source: This Blog Goes to Eleven. This style was mainly a British, European and Canadian phenomenon. Kansas became the most famous American progressive rock band. The Genesis News forum lists newer American prog bands: "Djam Karet, Birdsongs of the Mesozoic, Glass Hammer, Timothy Pure, Echolyn (very Genesis influenced), Discipline, Enchant, Spock's Beard." There is a longer list of American progressive rock groups here. A global list of prog bands is here. 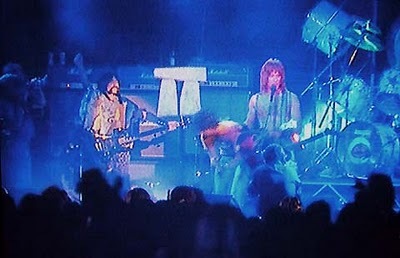 Aspects of prog were parodied in the Druids-and-Stonehenge sequence in the film, This is Spinal Tap (1984) as progressive rock became commercialized. By the 1980s, progressive rock was swept aside by punk, and the anti-punk, glitzy, synthesized New Romanticism. But new prog music was revived around the turn of the Millennium. Subsequent progressive rock genres are progressive metal, neo-prog, and new prog, also known as nu prog or post-prog music. Below the jump, some famous progressive rock pieces from the early 1970s to the mid-to-late 1980s. Several of these videos are not pure examples of the genre, but they all contain prog aspects. Anti-nuke protest, Tokyo, 15 July 2013. Image Source: LA Times. After the Fukushima nuclear crisis began in March 2011, public protests in Japan led to all of Japan's nuclear reactors being taken off line by May 2012. Then Japan had an election in September 2012, and Japan's new PM, Shinzō Abe, scrapped the plans of his predecessors. Now Japan is inching toward putting its reactors back online. CTV: "Hit by soaring gas and oil costs to run conventional power generation plants to make up for the shortfall, Japanese utility companies have desperately sought to put their reactors back online." This policy is going ahead despite multiple mass protests. On 2 June 2013, 60,000 people protested near the diet building in Tokyo to declare their opposition to the government's agenda. 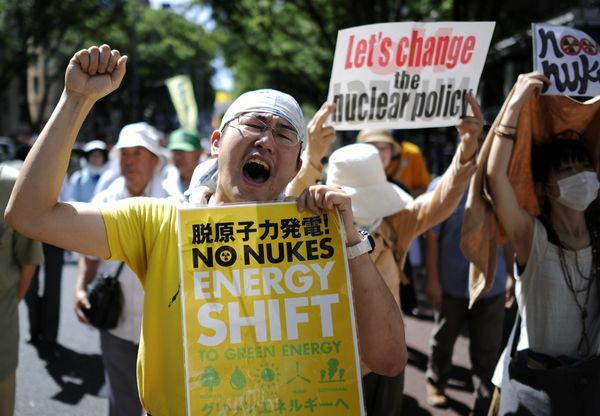 On 15 July 2013, 170,000 people protested the nuclear restart. In March 2013, anti-nuke activist and Australian physician, Helen Caldicott, organized a conference at the New York Academy of Medicine to discuss the impact of Fukushima. Webcast videos from the conference are here and you can see the talks on Youtube here. Akio Matsumura, one of the speakers at Caldicott's conference, observed (here) that nuclear issues will become the defining legacy of the 20th century, because nuclear waste has to be stored for 20,000 years or more. He expects the impact of Fukushima to last for several hundred years. In August 2012, it was learned that a Japanese supermarket chain tested U.S.-exported pistachio nuts for radioactivity and found 9.54 becquerels per kilogram of cesium-1 37 but no detectable cesium-134. (98% of all pistachio nuts are grown in California.) The pistachios contained about 95 times more cesium-137 than California almonds from 2011 and surpassed dozens of other food items in the supermarket's lab report for cesium content. The level of cesium-137 - a beta and gamma emitter produced in fission - in the pistachio nuts is equivalent to 257 picocuries per kilogram, which makes it more contaminated than most food items tested by the U.S. Public Health Service during the peak of nuclear weapons testing fallout (in 1963)! It is a curious matter that Californians themselves , who greatly value their fresh, locally grown - even organic and non-GMO - food, aren't concerned that the food they eat and export could be tainted with radiation. Back in March 2011, there were press reports of Californians depleting store shelves of iodine tablets statewide. Back then, why didn't Californians press existing radiation monitoring bodies (or create their own, like a group did in Vancouver, Canada) to ensure their food was safe ? What we have learned is that sustained inputs of isotopes into the environment from long-winded nuclear disasters in concert with chronic rains can lead to the formation of 'hotspots'' in 'wet areas' that often are synonymous with arable areas. Below the jump, see some videos from the Caldicott conference. Naoto Kan, Former Prime Minister of Japan during the Fukushima crisis, describes his experiences at that time. Arnie Gundersen, nuclear engineer and now anti-nuke activist explains the history of Fukushima and how the meltdowns occurred. And there is a press conference from former members of the American navy who were exposed to Fukushima radioactive fallout and now face a range of serious health problems. Steven Starr gives the talk: "The Implications of Massive Radiation Contamination of Japan with Radioactive Cesium." Bear in mind that pro-nuclear industry commentators would likely dismiss these arguments, even from physicians, as politically biased toward environmental activism. Some of the research presented at the conference was funded by the Samuel Freeman Charitable Trust. 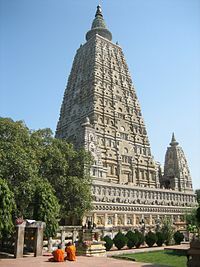 Mahabodhi Temple, built by Emperor Ashoka around 260 BCE . Image Source: Wiki. 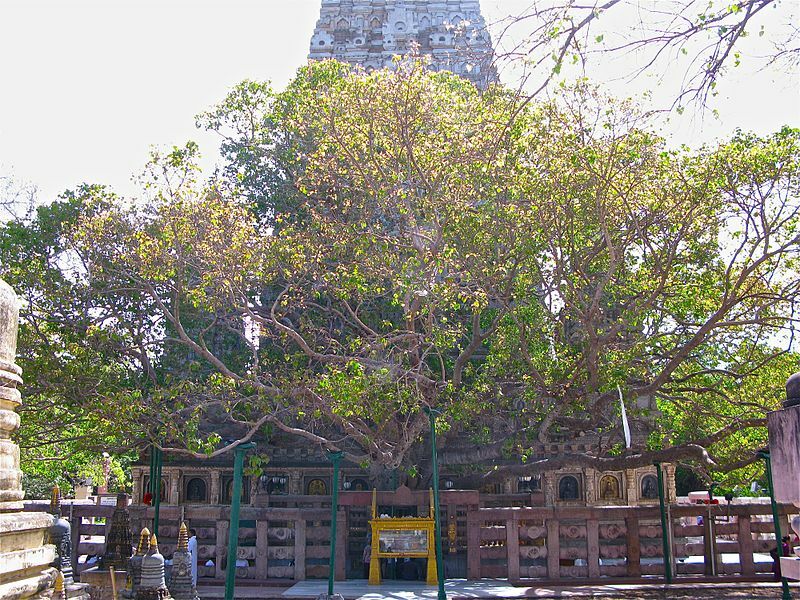 The site of the Bodhi tree at Bodhigaya is directly connected to the life of Buddha (566-486 BCE) ... [he] attained enlightenment or perfect insight when he was meditating under this tree. ... According to the Jatakas, it forms the navel of the earth, and no other place can support the weight of the Buddha's attainment. ... Buddhist mythology also states that when the world is destroyed at the end of a kalpa, the Bodhimanda is the last spot to disappear and is the first to appear when the world emerges into existence again. The myth also claims that a lotus will bloom there, and if a Buddha is born during that the new kalpa, the lotus flowers in accordance with the number of Buddhas expected to arise. 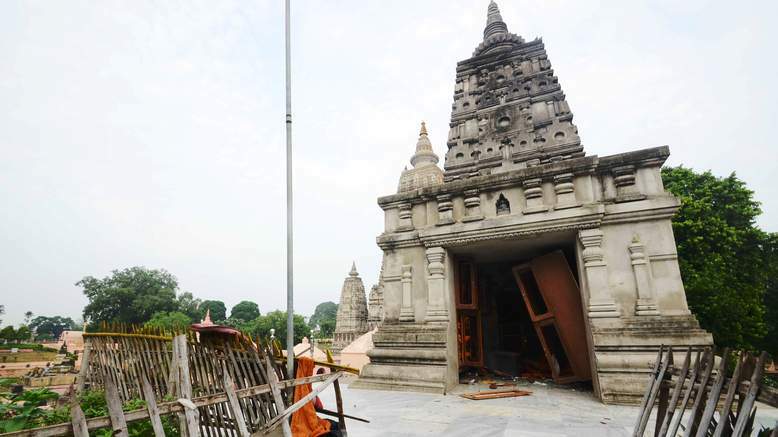 Further reporting from the Telegraph: a bomb was placed at the foot of the temple's 80-foot-tall (24-metre) statue of the Buddha, but did not go off. "An injured Buddhist monk receives medical treatment at a hospital in Gaya, on July 7, 2013." Image Source: AFP. "A Buddhist monk is carried on a stretcher after the attacks in Bodh gaya." Image Source: Manish Bhandari/AP via Daily Telegraph. 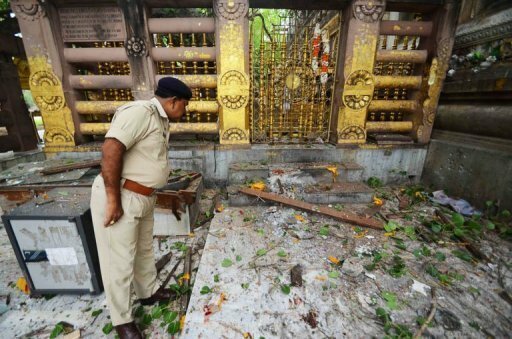 "A policeman looks at debris at the Bodh Gaya Buddhist temple complex, on July 7, 2013." Image Source: AFP. "The entrance to a Buddhist temple edifice at the Bodh Gaya temple complex was torn apart by the explosions." Image Source: Sky News. 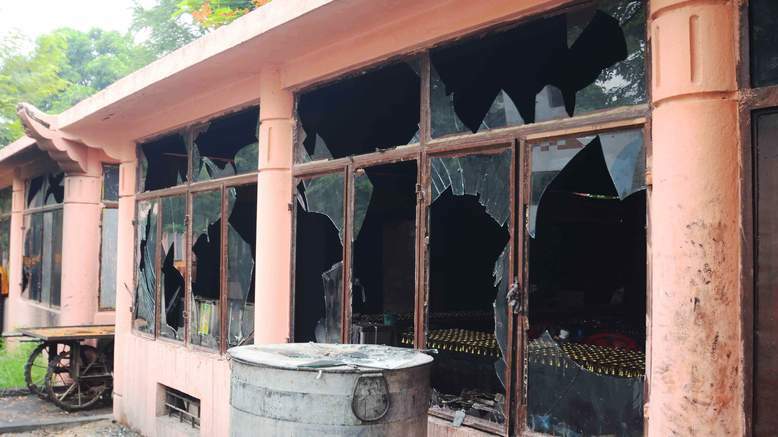 Broken windows at the Bodh Gaya temple complex. Image Source: Sky News. 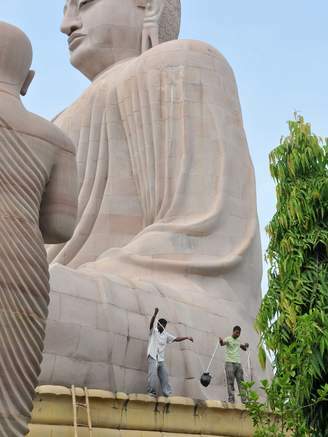 Bomb disposal personnel recover an unexploded bomb at the foot of the great statue of Buddha. Image Source: Sky News. 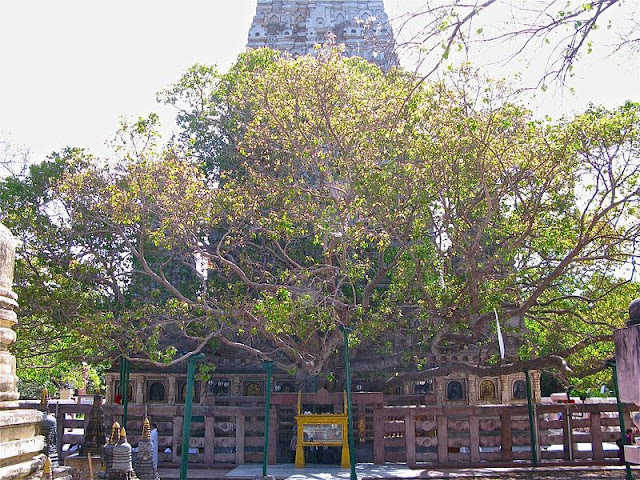 The Mahabodhi Tree in Bodh Gaya. Image Source: Wiki.